In the endless parade of small, burnt-orange species of Lactarius in North America, Lactarius areolatus can be distinguished by its cap surface, which becomes scurfy and wrinkled fairly early on in development--and by microscopic features, including the ornamentation of its spores, which feature isolated warts and frequent but scattered fine lines. In fact the business about the sporal ornamentation is virtually the only thing separating Lactarius areolatus from Lactarius rimosellus, and I am very tempted to treat the two species as synonyms (in which case rimosellus is the older name and would take precedence). However, my collections have been consistent, and none has featured the almost completely isolated warts described for Lactarius rimosellus, lending tentative support to the idea that two species may be involved. 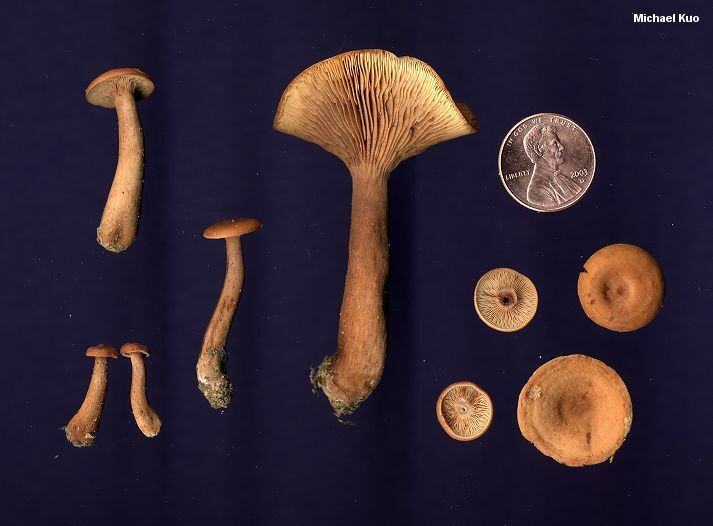 Major American herbaria do not include many specimens labeled "Lactarius areolatus" from the southeastern United States--but they include plenty of Lactarius rimosellus collections from across the southeast. 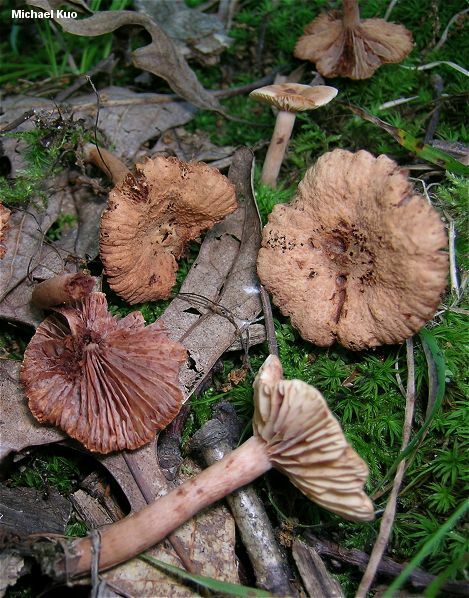 Since Lactarius areolatus is well documented in Mexico (Montoya & Bandala, 2008), I imagine that many of the "Lactarius rimosellus" collections in herbaria from southeastern states and Central America actually represent Lactarius areolatus. 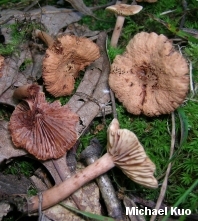 Ecology: Mycorrhizal with oaks and with hornbeam; growing scattered or gregariously; summer and fall; fairly widely documented in the eastern United States from roughly the 40th parallel northward--but probably also found in the southeastern states as well, misidentified as Lactarius rimosellus (see note below). Cap: 2-7 cm; convex to bell-shaped, quickly becoming flattened or centrally depressed; moist or dry; bald at first, but soon becoming roughened-scurfy and wrinkled; dark reddish brown to orangish brown when very fresh and young, becoming burnt orange to pinkish brown or orangish brown; the margin becoming lined and/or scalloped. 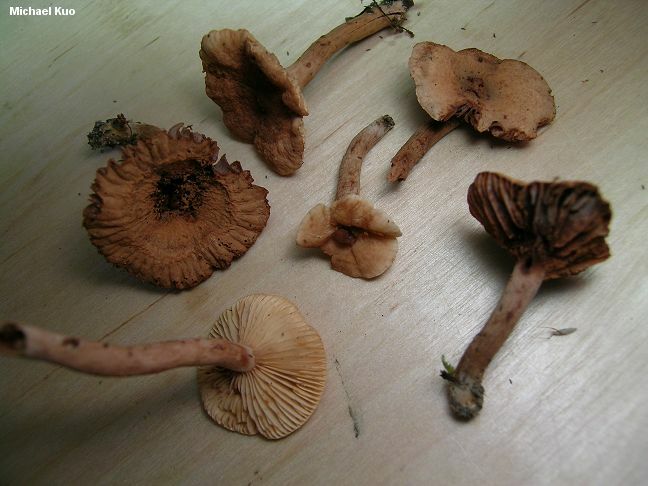 Gills: Beginning to run down the stem; close or nearly distant; creamy to pale yellowish at first, developing cinnamon spots and eventually discoloring cinnamon; not staining from the milk. Stem: 2-9 cm long; up to about 1 cm thick; more or less equal; bald; without potholes; colored like the cap, or paler; hollow; dry. Flesh: Pale orangish to pale cinnamon; brittle; not staining when sliced. Milk: Watery to whey-like; not staining tissues; not staining white paper. Odor and Taste: Odor not distinctive--or slightly to strongly fragrant (even a little reminiscent of Lactarius camphoratus); taste mild. Chemical Reactions: Cap surface olive with KOH. 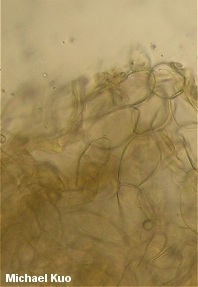 Microscopic Features: Spores 6.5-9 x 5-7 µ; subglobose to broadly ellipsoid; ornamentation 0.5-1.0 µ high, as isolated warts and scattered but frequent ridges that do not form consistent reticula. Macrocystidia absent. Pileipellis a hyphoepithelium with terminal elements that tend to inflate and aggregate with maturity. REFERENCES: Hesler & Smith, 1979. (Hesler & Smith, 1979; Montoya & Bandala, 2008.) Herb. Kuo 08270208, 06200303, 06260904.